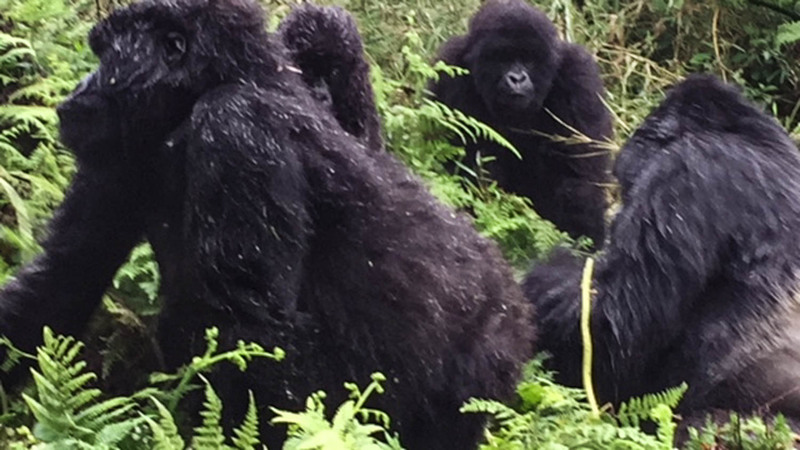 Our next stop was Rwanda do to some Gorilla Trekking. We had no idea what to expect. 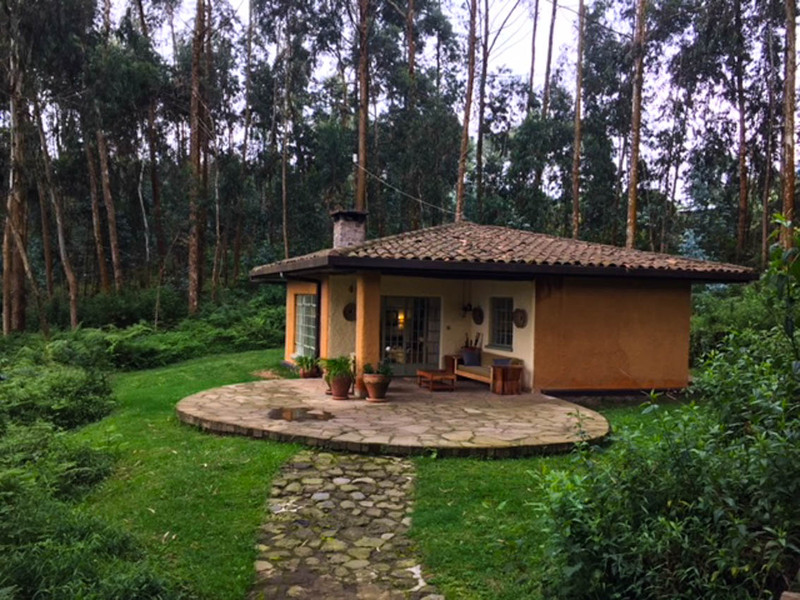 Sabyinyo Silverback Lodge our home for the next 2 days was set within a forest high in the mountains of Rwanda. The trek to our cottage alone was a workout that I soon got use to. 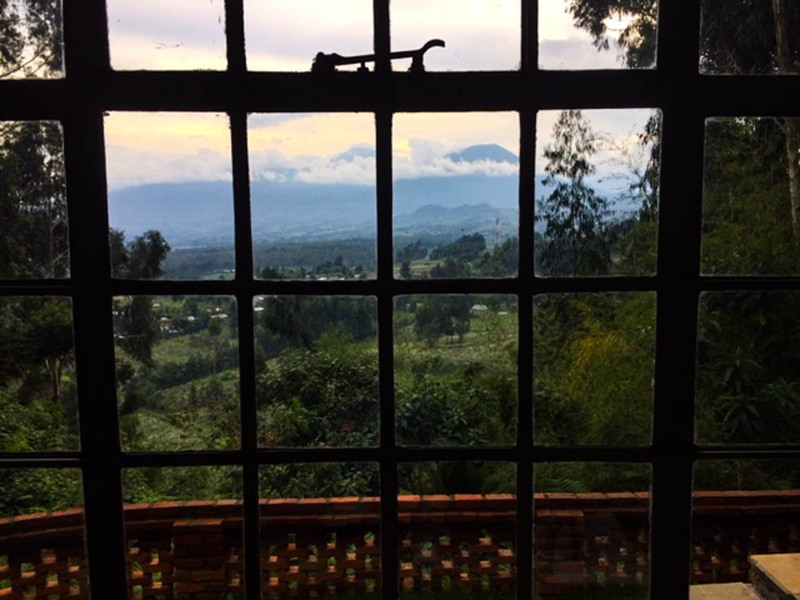 I said to my daughter, “how on earth do handicapped or the elderly make it to their rooms?” Her reply was, “people only come here to do the gorilla trekking, so they have to be in shape.” I doubted at that point if I was in shape, however, I think it was more an altitude issue because in no time we were fine. That next morning after our arrival we were up at 6am, ate a hearty breakfast and met our guide. 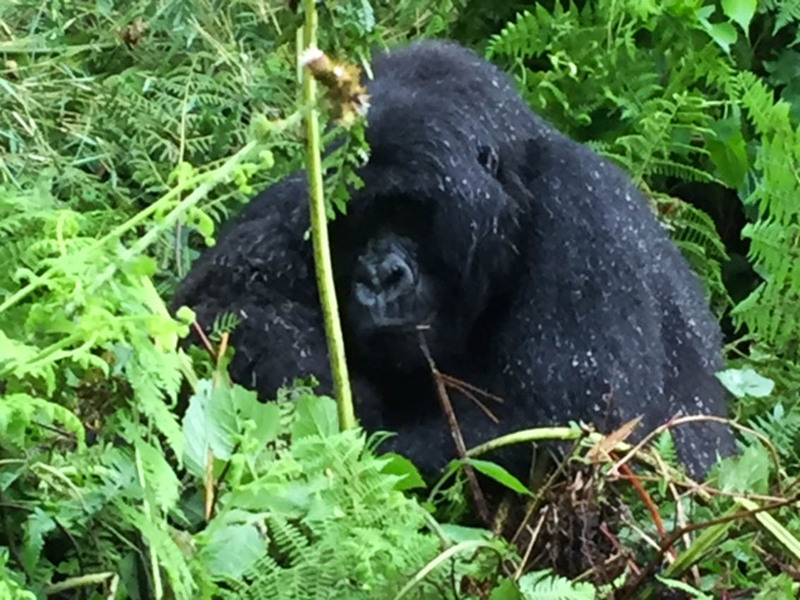 He took us to a location to be prepped on the do’s and don’ts meeting face to face with the gorillas. We were both excited and a little nervous. The trek up and back to the gorillas was just over 3 hours. It was pouring down rain the entire time. We were in a group of 8 trekkers total, all from the United States. 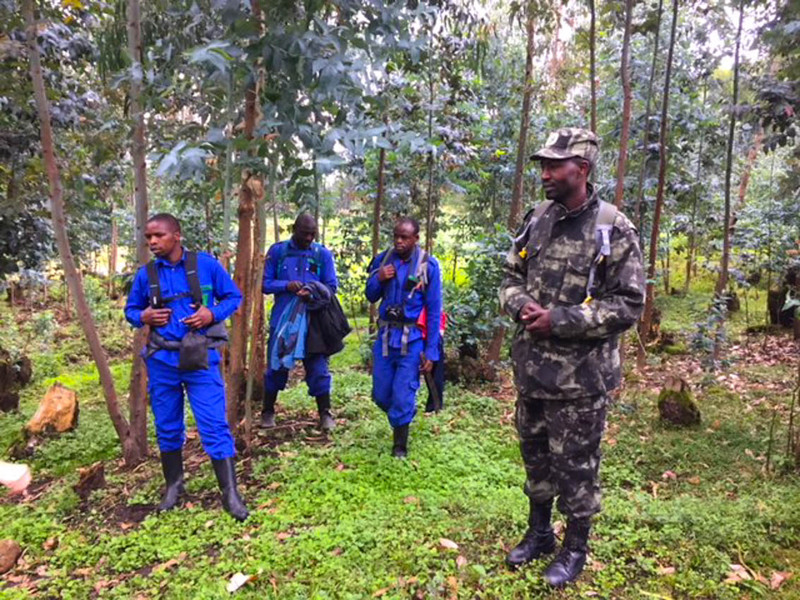 Each group had 2 guides and 3-4 trackers that determine exactly where the gorillas are. Our guides encouraged us to hire porters to carry our backpacks and to help us up the mountain. They said it helps provide the porters with an income so of course we all opted for it and quite frankly I was thrilled. The porters were a godsend, especially in the pouring rain where the mud got a bit deep and slippery. We brought gaiters to go over our legs and around our shoes to keep our pants dry, and bugs out. However, the lodge did provide those for anyone that came without them. I had also been told to spray our clothes to keep the mosquitoes off which I did, however there wasn’t a mosquito in site. Our trek up the mountain was literally through the rain forest, thickly covered with trees and some prickly plants that stung if you bumped into them. They didn’t harm you just stuck you like a thorn. The forest was so lush with some open areas of bright green grass. 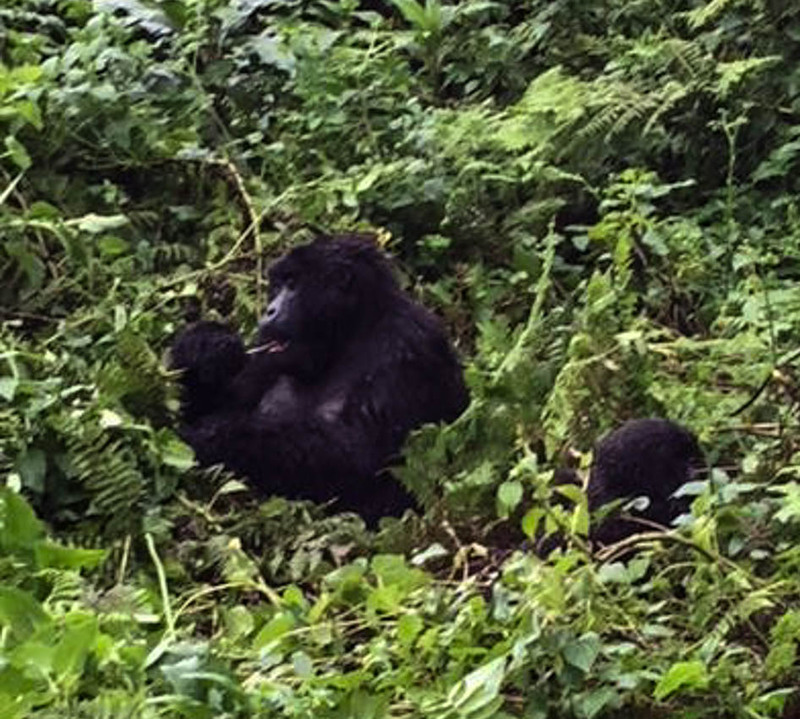 After about an 1.5 – 2 hours we found a family of Silverback Gorillas. Oh my goodness, they were huge! I believe they said one of them weighted approximately 750 pounds. We were told not to make eye contact with any of them and to walk slow, and talk soft if we needed to talk. 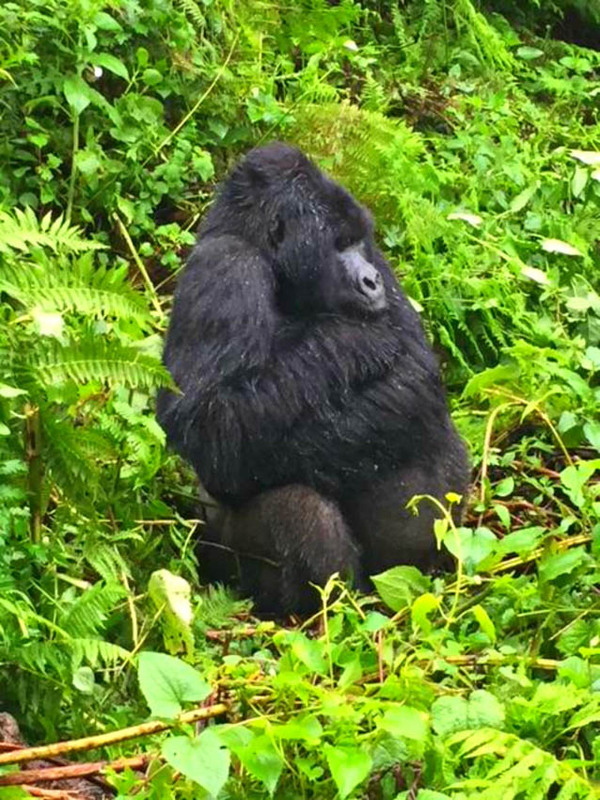 Our guides made gorilla sounds when anyone moved. I’m not quite sure what that was about. I’m guessing they knew what they were doing, unless it was just to entertain or scare us. It did both! We were quite close to the gorillas, in fact one of the gorillas decided to move and brushed up against us. An older man was standing in front of my daughter and got so frightened he stepped on my daughter and fell on top of her. He was horrified! At that point I think she was too, especially with both of them on the ground. All was fine though. Honestly the gorillas must be use to people coming to see them. In some ways I felt like some of them were showing off. Here’s a video to give you some idea of how close we were to them and their mannerisms. The mom with her baby was sweet. 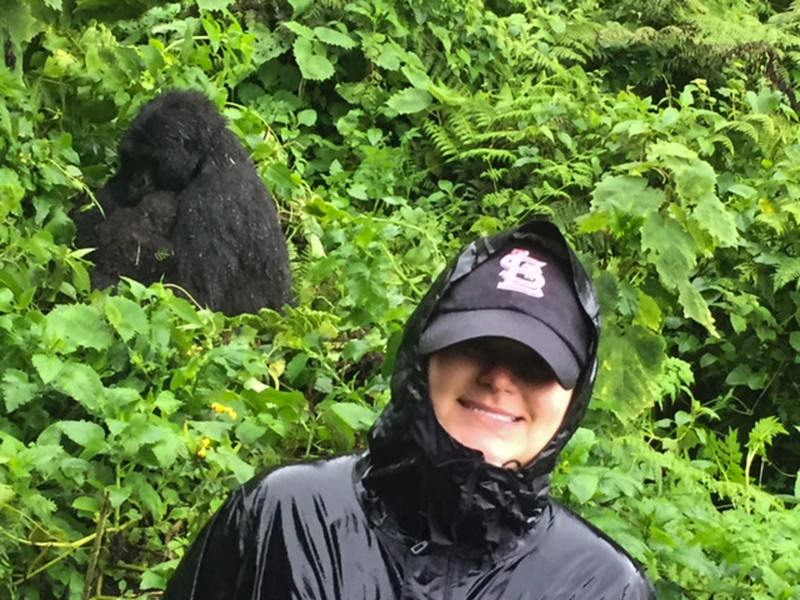 Apparently gorillas hate the rain, yet they were clearing standing right out in it, not under a tree for cover. The mother used her body to shelter her baby from the rain. You can see the spots of rain all over their fur. One of the gorillas was constantly eating bamboo, then a stalk they peel and eat that’s filled with liquid for hydration. That gorilla had his back to us and was constantly farting – LOUD!!! For goodness sake, you would have thought he would have been a little more discrete, but he didn’t seem to care. 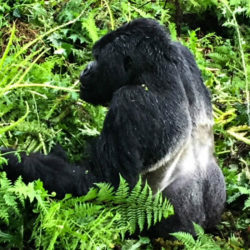 Once we located the gorillas we had an hour to observe them. Then we left to go back down the mountain. 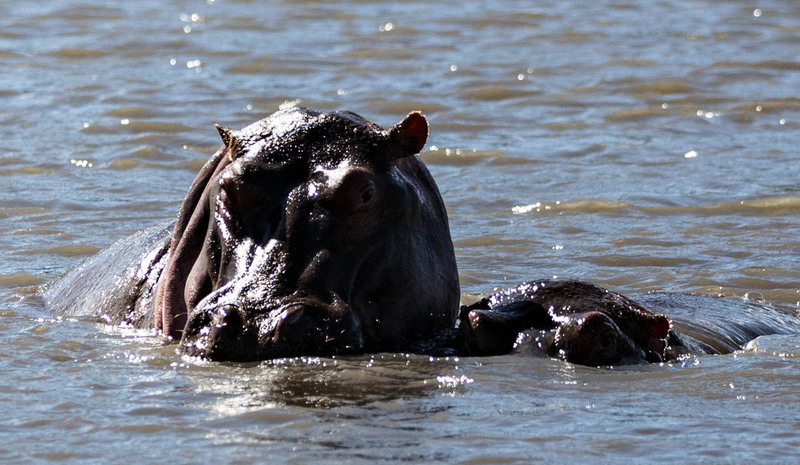 It was a wonderful experience and such fun to see how they live and relate to each other in the wild. 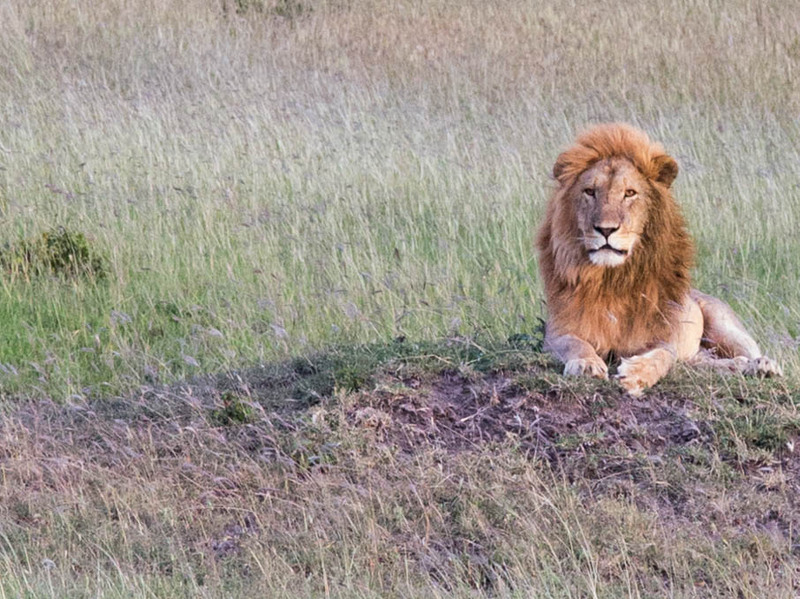 In fact, in many ways they were just like people as were the animals in Tanzania. After a while you could understand their emotions, eyes, their words and gestures. It was all so fascinating. After a day of gorilla trekking we went back to the lodge, cleaned up and had a late lunch. I had a Smoked Chicken Salad with Mango that I loved so much I requested it for lunch the next day as well. Below is the recipe with ingredients you may already have on hand. It was so good and satisfying. Since we were in Rwanda for just 2 days our last day we took a trip into town to visit the market to buy some baskets. Then headed back to the lodge to finish packing. Our flight took off at 10:30 pm and with a 3 hour drive to the airport and 2 hour required arrival for security, we left at 5:30 pm. Our journey back to the airport was interesting. We started in daylight and ended up getting to the airport at dark. The roads were filled with people walking. Many carrying goods on their heads. Children walking alone for miles to and from school. Even when darkness came single children both boys and girls plus women would be walking solo. I was surprised. You’d never see that in the states anymore. It concerned me, but then our guide told me it was safe. Yet security at the airport was so strict it made me wonder. No one smiled at the airport. It was so unsettling. The security guards meant business, and let you know it. By the time we made it to Cape Town with a middle of the night stop in Johannesburg to sleep, our travel time was 19 hours. Our final destination was Capetown South Africa before heading back to the states. I’ll share that in my next post. 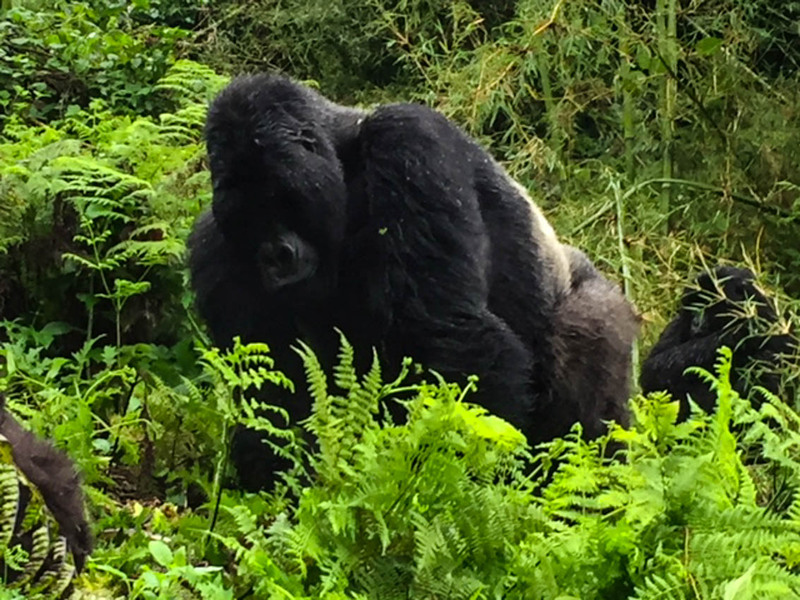 In the meantime, I hope you enjoyed my photos of the gorillas and the recipe below. My gorilla photos were all taken with my iphone. I didn’t want to risk ruining my camera in the rain forest. Below is the recipe for the Smoked Chicken Salad with Mango……………. Place green beans in a circle around the bowl pointing outward. Place a small handful of fresh spinach in the bottom of each bowl overlapping green beans. 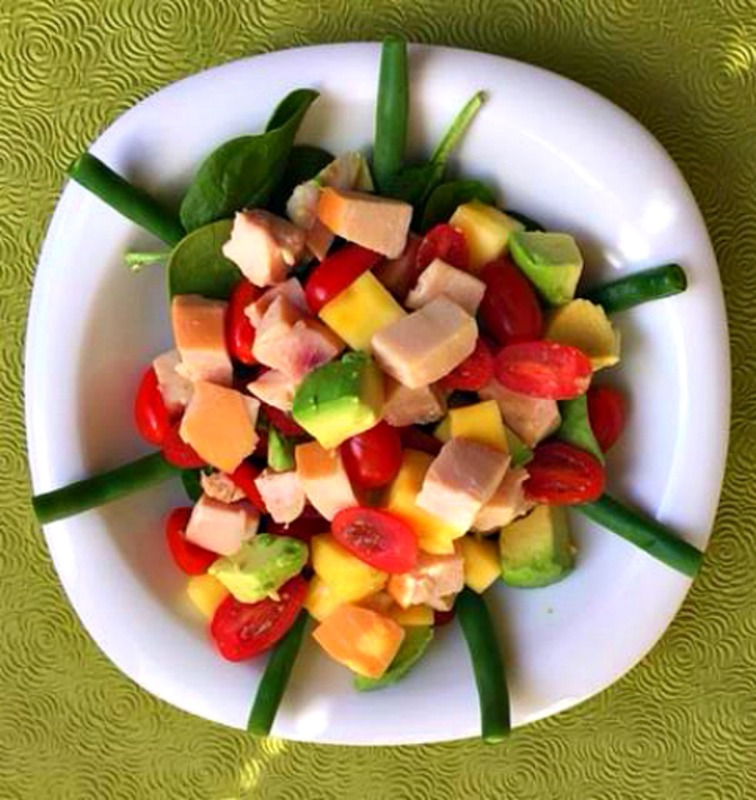 Combine chicken, tomatoes, avocado and mango, then place on top of greens. Serve plain or lightly drizzle with vinaigrette of choice. So close to a gorilla…Amazing! The salad looks light yet flavourful…a perfect lunch for me. Yes we were literally standing with them – actually too close! I added in a video that I forgot to post so if you didn’t see it go back to check it out. It’s fun to watch them eat and move around with the baby on the moms back. Glad you liked the salad as well. What a sweet mama gorilla! And the view from your lodge??? Wow. Such an amazing experience. Love your simple salad, too! The view was actually from our room. I guess I didn’t explain that well. Yes the mama gorilla was sweet. I added in a video that I forgot to put in initially. You can see the mom walking around with her baby on her back and the big guy eating. You might enjoy going back to check it out. What a fun and fascinating adventure you two had Vicki. I know you made memories that will go with you always! It was so much fun and yes it’s something we will never forget. 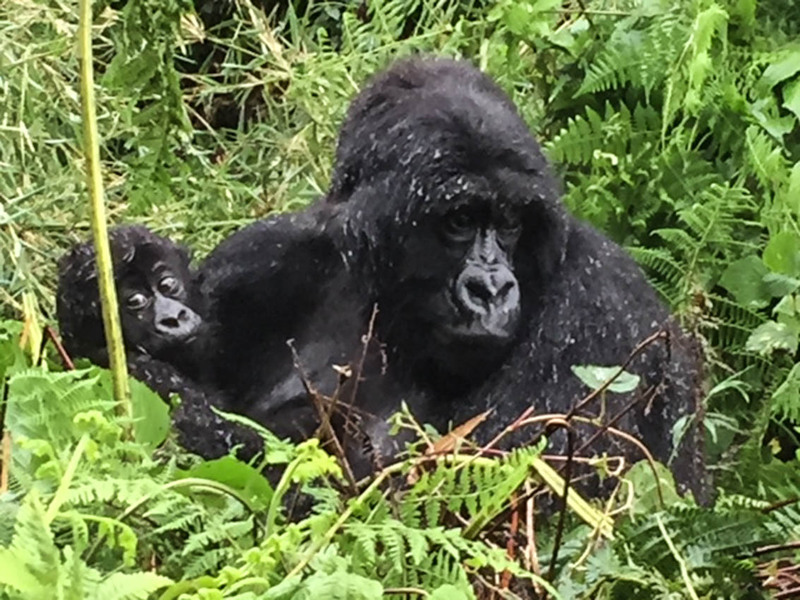 I just added a video that I forgot to include of the gorilla family eating and walking around with the baby. I hope you’ll go back to check it out, it’s quite entertaining I think! Such an amazing time you had! 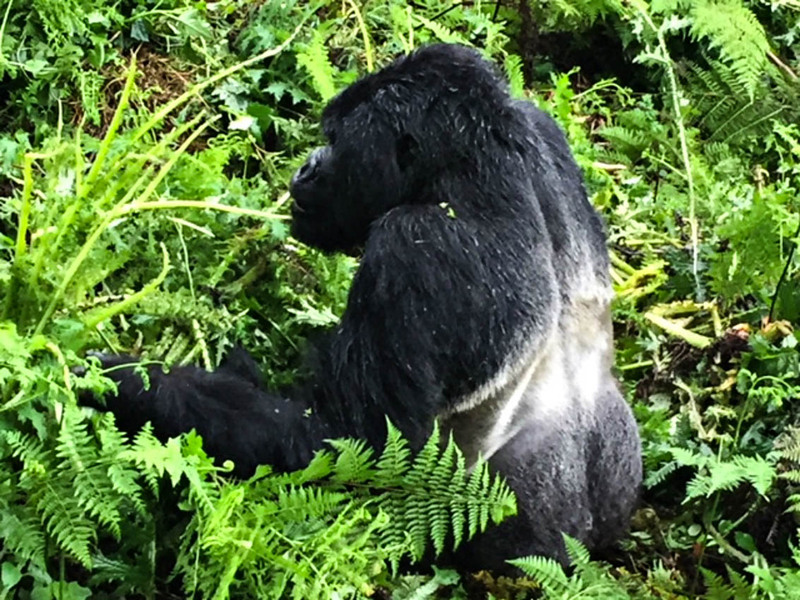 Wonderful pictures — and how neat to be so close to the gorillas! It was so cool to be that close. A little scary at first but then it seemed like they got use to us. I’m sure they have human visitors all the time. Glad you enjoyed the photos. It was a great time!